Flour doesn't always mean wheat—some flours are, in fact, safe! Most people who think of "flour" assume that "flour" is equivalent to "wheat flour," which would mean that all flour contains gluten and therefore aren't safe on a gluten-free diet. It's true, however, that the vast majority of foods made with flour will not be gluten-free. 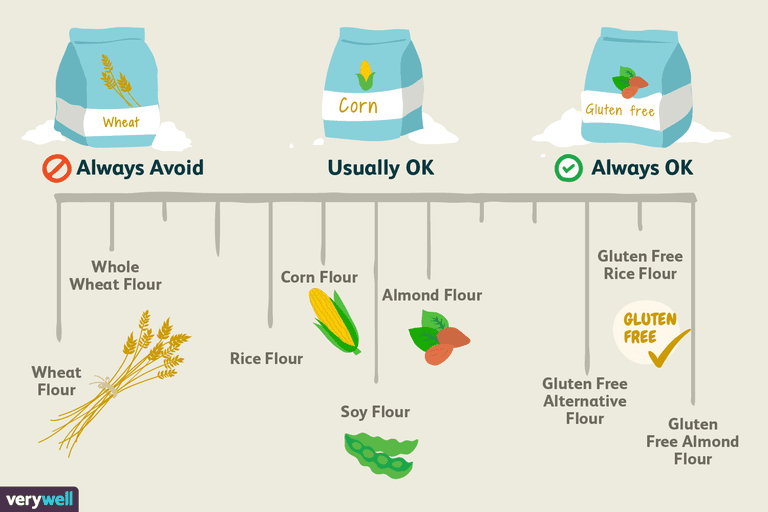 So read on to learn how to identify foods made with gluten-free flour. The U.S. Food and Drug Administration allows manufacturers to list wheat flour as "flour" on food labels. In fact, the word "flour" is reserved for flour that's made from wheat. Wheat flour also can be listed on a package as "whole wheat flour" or "wheat flour"—both of those also contain gluten, so the product can't be eaten as part of a gluten-free diet. To be safe, you should learn how to identify gluten on food labels. However, if you see the word "flour" on an ingredients list preceded by a word like "rice" or "corn," that food may be gluten-free and safe for you to eat. Even though flour most often is made from wheat, flour doesn't have to be made from wheat—by definition, "flour" is simply a powdery substance made by grinding a starch. The starch is usually a grain, but not always. You can make flour from almonds, chestnuts, and even potatoes in addition to different types of grains, and many companies sell these specialty flours. People following a low-carb diet often use almond flour in place of grain-based flours, for example. Flours made from a starch other than wheat, barley, or rye are usually gluten-free (but not always). When you're reading ingredient labels, you'll see that flour made from anything other than wheat always will be identified as such—for example, it will be listed as "rice flour," "soy flour," "chestnut flour," "almond flour" or "(fill in the blank) flour" instead of just as "flour." While these alternative flours are usually gluten-free, they're not always safe on a gluten-free diet due to gluten cross-contamination in processing. The equipment to harvest and mill coarse grains or seeds into flour is pretty expensive, and so farmers and manufacturers frequently use the same equipment to process both gluten-containing and gluten-free ingredients. When that occurs, naturally gluten-free ingredients can be cross-contaminated with gluten during harvesting or processing. That may mean they will contain enough gluten to make them unsafe for someone with celiac disease or non-celiac gluten sensitivity to consume. Also, some products that use alternative flours as ingredients also include gluten as another ingredient—to eat gluten-free, you always need to check ingredients carefully. Of course, many foods made with these alternative flours are aimed directly at the gluten-free market—they'll display the words "gluten-free" prominently on the package, which means they should be safe on the gluten-free diet. The bottom line is, if you see the word "flour" on a food label, you need to read further before you can tell if the food contains gluten or not. But if the ingredients label provides no detail other than something like "flour, sugar, yeast, shortening" then you should assume that particular type of flour contains gluten.